Not that it matters too much, but I went on to the Leenane 5 mile website to see what my actual result was, only to find out that I have been blotted from all records! So has my running partner, Dara... I'm guessing that we are the two ?? at the 40minute mark, but since we finished together I wonder why there's a few seconds difference in the records?! Finishing the Leenane run in fine spirits with Dara. Leenane, or Líonán (as us speakers of Gaelic know it! ), is the most picturesque of little Irish villages. Situated at the foot of the Maam Turk Mountains in the west of Ireland, it boasts a view out over our country's one and only fjord - Killary. Oscar winning films, such as 'The Field' and 'The Quiet Man' have been shot on location in or around this village, so, without any doubt it's offically a 'beautiful spot!'. It can also be an isolated part of the country - a few years ago the main bridge connecting the village with it's nearest big town collapsed, a fate that meant ridiculously long journeys for the simplest of services (doctors etc). Thankfully the bridge was rebuilt and the community pulled together since to ensure that an ambulance service be provided in the area. 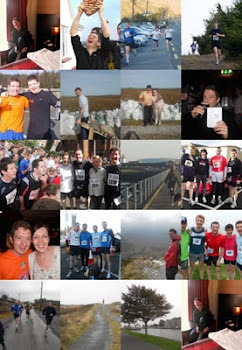 One of their fundraising drives is the annual Leenane 5 miler (annual since last year!) which took place yesterday! Dara, myself, Setanta and Big Ron - a good day for all! Pace: Around 8min or just sub. D bravely feeds a horse in the wee county! I have been suffering from a dose of the post marathon blues these past two weeks, so getting back to the racing circuit was just what the doctor ordered. Darver is a lovely little village in mid-County Louth, not far from where my wife hails. Today's event was a cross-country four miler, on the grounds of the Louth County Football team's training pitches. It was a tough route - with man made mucky hills, watery turns and sections of gravely path. Worst of all, there were only about thirty competitors and they all seemed to be super athletes. At the start we had to run up a steep hill - we went off like the hammers of hell. I realised half way up this hill that the pace was ridiculously fast for me, but I went with it for a while. The course consisted of four one mile laps, and quite honestly I felt like quitting half way through the first one! Sense prevailed, however, so I slowed up significantly and concentrated on my own pace. Looking over my shoulder I could see about seven others behind me, and I was sure enough that I could stay ahead. So I bedded in! It turns out that I completed the run in 29.08mins - about 7.20min pace. This was a bit of a shocker for me - I thought I was way slower during the run, but the field was so fast that it made any normal run feel like a plod! There I am enjoying my 20th pint of the year, two weeks ago after the Dublin City Marathon... Four more pints left in this year! There I am, strutting my stuff in the Dublin City Marathon last week! The sheer joy of crossing the line in Dublin - I was still unsure of my official time at that point, but I knew it was a good bit better than the race clock of 3.45.45 (it took us nearly two minutes to get from back of the pack to cross the start line). As it happens, 3.43.57, was better than I ever imagined.